GEOFF CUTMORE: So, what I want to start by asking you is why now? Why proceed with this action against the U.S. Treasury now given that the sanctions were originally imposed back in April of last year? OLEG DERIPASKA: As a businessman I always tried to see what would be less costly resolution. And since it was quite a huge surprise for us, this April 6 action, unexpected…It was out in the ground. And in many sense, absurd. Then to disturb market, to disturb the way aluminum industry, the global aluminum industry function. Of course, we had almost no plan to be prepared. And I personally was taken, as you know, in the step, by full surprise. And I hope that sooner or later people will recognize it's wrong. We'll try to assess the facts and actually it's getting worse and worse. And last hearing in Congress when people start blaming me personally for any sort of things which I had no connection even with, not just based on fact just fantasy of course it’s given me a total understanding that the legal system in U.S. maybe the last resort where people could assess the facts and to see what justice would be. GEOFF CUTMORE: Can I ask you-- there will be a lot of American viewers of the decision that you've taken here who will question whether you've been given approval by the Kremlin to do this or whether in fact you were pressured by President Putin or the Kremlin as a way of testing the mantle of the Treasury and the U.S. legal system? OLEG DERIPASKA: They are wrong. GEOFF CUTMORE: So there's nothing to that? OLEG DERIPASKA: It's totally wrong. GEOFF CUTMORE: Why do you think you can win then if you've taken this action on your own behalf given how swinging the sanctions that were imposed originally were and how much pressure you were put under to distance yourself from Rusal and EN+. OLEG DERIPASKA: Because I still trust U.S. legal system. There is no facts. You know, so very often when you know you can read in a very impressive title a lot of balderdash and then in the small sentence. If the facts are, or if it's true, and since they know no facts, no reason, for such action, existed then in April, when that was taken, then I still believe that justice could be achieved in this case. GEOFF CUTMORE: So there was no pressure from the Russian government for you to take this action. Tell us then why you feel you need to do it for yourself. How personally have you been impacted by the sanctions both emotionally and financially? OLEG DERIPASKA: As I told you when you talk when we met. It’s a new life. It’s a new reality. it's a very strong instrument which was developed and I still believe that…it’s, I don’t know liberal I would say…I’m maybe a little bit conservative on the economic issue but weaponizing financial system, opposition the financial system, using the position of U.S. Treasury and Fed, literally, as a weapon can be justified. If it's drugs, nuclear proliferation, trafficking. But to apply same means, same tools to entrepreneurs, crushing all concept of presumption of innocence, of fair process. I don’t think it’s something which will stay long. It's like the same way like you have a guy who supply water to the villages, down to mountain, sitting on top and he gives clean water to one village and then in one village which on a low level is being poisoned with it, of course sooner or later this village will develop its own well and say thank you. It's not. But again I still feel that the rest can do justice. And this is what in my case about - simple justice. GEOFF CUTMORE: Is it true the reports about how much money you've lost as a result of the action that's been taken against you? Anywhere between five and seven billion dollars roughly your net wealth – is that accurate, those figures? OLEG DERIPASKA: And of course you have in a day, day to Day deviation in the price of assets. And you know this is going on in every day you know literally, you know, me my company my colleague and others they suffer they still suffer. GEOFF CUTMORE: So this feels like an emotional decision. But is there any hard-headed business element to this? Some may say that you risk a backlash against both Rusal and EN+ by doing this. OLEG DERIPASKA: No one done this, this is my burden. I’ve done a lot of things first time. First time, in the 90s, I bought a small stake in small aluminum company in the middle of an hour or so be a Siberia. I came by myself and I said I want to be part of the board and they said goodbye. It took me two years before I get a seat. And in these two years the company collapse because you know the market the famous crash in the 90s a lot of commodities flew out of Russia. I've got my seat and I become a CEO of this company you know. No money, no working capital, no raw material supplies, people on strike. I did first time in my country. Yeah, I understand, but again there is no facts no ground, statement which was as a press release at Treasury Department. Total absurd. This allegation was there for more than 20 years and people always hide. Of course I have a lot of opponents, I have a lot of people who I don't know why but strongly don’t like me in the State Department, and spread all these rumours. Every time when I tried to check the facts, who is this victim? Give me his name. No. They always try - oh go and look on the internet. What's the justice – look on internet? No you have to know by yourself. GEOFF CUTMORE: But you have to understand a lot of the narrative around this. I mean people look at you and they look at the interest that you've displayed in American politics over the years. The fact that I think you, you met up with John McCain during his campaign I think that was facilitated by Paul Manafort, and they ask themselves why - why is this man so interested in the presidential process in the United States? What do you hope to get from that? What do you hope to achieve? OLEG DERIPASKA: Maybe subject of a different interview. I'm sorry. Still I'm a little bit more focus on my issue. We can have a talk on the broad issue but it's not something which I'm interested in. And most of this allegation they use my brand. I am successful, from Russia. I know a lot of people. I've been lucky that channels like you have always been interested in my opinion on the markets and on the economy. Yes, they branded me. It was so easy you know “there is a bad Russia, [inaudible] activity and there is bad Russians.” If you will mention any names from the street, from streets of Moscow who would care – no one. So they decided to use my name. But now I tried to see how U.S. legal system will respond. It's very simple process. Justice Department will present facts. I hope that they will not hide behind national interests. Whatever…the spying source…I’m a businessman, I'm an industrialist. What can prevent them to put the facts and lay down in a simple you know file to a court and the judge will see. Was it enough to prove he wasn't qualified to begin with these executive orders which been used to put sanctions on me and companies or not? GEOFF CUTMORE: These two things are connected though. And I understand why you're reticent perhaps to talk about it but in many ways the reason why the sanctions were imposed in part because you're perceived to be the person that you are. So, I think it's relevant to ask you the question. I mean the former CIA station chief here Steve Hall who was in Moscow, I think talked about you and Manafort and the connection between you and Manafort and said if you want to understand this, this is like the connection between Putin and Trump. Now why would he say something like that if there wasn't a perception that somehow you're connected. I mean how do you respond to those kind of comments? OLEG DERIPASKA: To be honest I didn't get that. I'm sorry. Can you just elaborate a little bit? 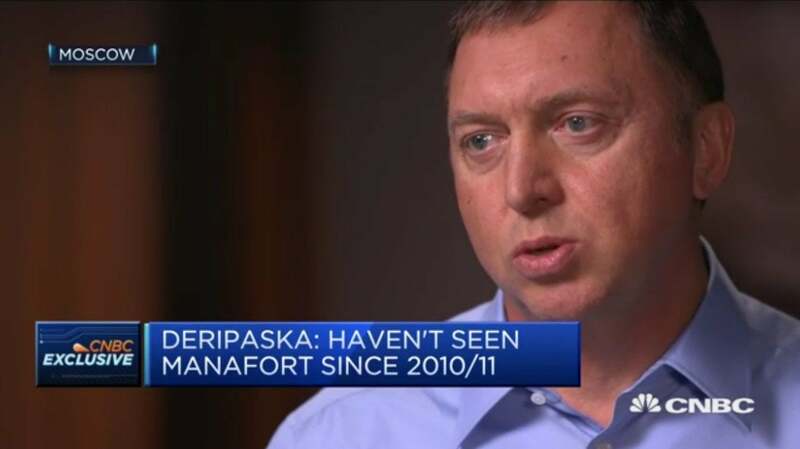 GEOFF CUTMORE: Do you not see the connection between the action that the Treasury has taken and the perception that you were connected with Paul Manafort and how somehow mixed up in the 2016 election campaign? OLEG DERIPASKA: It's like you know, [inaudible] kind of story. Very Absurd. Manafort provided some service for a company which has investor founded. All the relations was all like seven or eight years ago - maybe more. No relation after 2011. Only interests, my lawyers tried to find him and tried to file and you know recover this money which was [improperly] taken as a credit and never returned and this investment that never happened. And it's quite a big sum of money, $50 million. Then this action in April when literally you know after I've been caught from any access to justice, you know legal firm needs to have license. No legal firm wants to be part of it because it will damage, and this narrative of course will affect the reputation. It was very healthy when he asked me why it takes one year you know it takes me nine months to hire a lawyer who is ready to take this case. And then I said and I repeat and my people publicly make available information that September 16 it was a nice intrusion in the morning when they came to be part of UN conference on climate. In my house where I'm staying and start asking a stupid question. And you know just it's absurd. Where is Manafort? Where is Russia? And the way it was even in a time when I think your president was like twelve point below Hillary Clinton in the beginning of September and it's still going on. Yes, it's again it's kind of a brand issue. They used Deripaska brand and use this narrative. And it's look like much but I'm surprised that you are saying that the guy who is a part of your intelligence who says the difference between the facts and if type of statement which journalism now in US tend to produce. GEOFF CUTMORE: So, in your opinion this is just muck-spreading all these allegations that continue to crop up connecting you with that 2016 campaign. And Paul Manafort and ‘special’ briefings which apparently turned up in an e-mail. None of this is true in your opinion? This is journalists and just US Senators who are just spreading falsehoods? OLEG DERIPASKA: US Senate what do you mean? Well, there is a lot of Senators. OLEG DERIPASKA: I said if you want to hear the facts, I am ready to come. Then they start making this charade that I was asking immunity, blah blah blah. I didn’t ask anything. You want to have straight answer then as I did 2016 when FBI came and stopped and questioned me on anything like that and I've said it's absurd. And I gave them argument which people should listen. No one wants to hear the fact, but your gentleman Mueller, sorry not your, U.S. Attorney Mueller, he will produce the facts and show the facts coming soon. GEOFF CUTMORE: I think it's useful for us to use this opportunity for you to restate your position on these things because these questions keep coming up over and over again and it's almost like people don't feel they've heard the answers that they need to hear to be convinced that there was no connection. I mean what was your relationship to Konstantin Kilimnik? Did he pass any Trump polling information to you? OLEG DERIPASKA: I never met him and by the way when you write it…not you…sorry, I’ve become a little bit emotional. But when journalists write Russian Kilimnik, it’s my understanding from open source he's Ukrainian. I'm not sure but this is something which also absurd why you would in a paint someone as a Russian if he's Ukrainian but I’ve never met him. I haven't seen Manafort since 2010 or 11. The only purpose for me or my people to have any interest in his, you know dealing future, was to get money back which was borrowed from my companies or and unproperly taken from investment which wasn’t done. And it's a big sum up to 50 million. That's why when they seized some of -- your colleagues tried to paint success of Mueller probe, that they’ve been totally [inaudible]. For me it's also hard. It’s not the money which would be taken from me if it would happen. I wouldn't find the lawyers who will defend my interest. OLEG DERIPASKA: Why would be the case that fact doesn't fit narrative well I don't know its US situation now. There is facts and there is something which you want to promote. GEOFF CUTMORE: So in the emails that were released apparently Kilimnik wrote an email to Manafort saying you asked him to convey several important messages to Manafort. OLEG DERIPASKA: It’s not true. Let’s state the facts. Manafort plus consultants which not tens of million which is balderdash in advance and blah blah blah Russian state. It's total balderdash. Never happened, never offered. Last consultancy was in Africa and not very good because it was no result. 2011. Never seen him after. In my view, after that he was totally, even from the open source, he was totally focused on Ukraine. Ukrainian clients. It's obvious for any investigative journalist who will go and check what these people were doing. They have a bunch of their clients and I'm sure his clients officers had caviar, I’m not eating caviar. GEOFF CUTMORE: So, there were no political favours done for you in return for the financial debt or obligation that Paul Manafort incurred to you. That's what's been implied largely that he supplied you with information about the campaign because there was a financial obligation to you that he couldn't pay. OLEG DERIPASKA: Absolutely not, absurd. GEOFF CUTMORE: So just let me underline this. I want to move on and talk some more about some of the other issues that I think are very important to you and to us. But just to underline this. Do you have any knowledge that Paul Manafort or Mr. Kilimnik were working for a Russian secret agency or possibly the GIU to further the government's interests? GEOFF CUTMORE: You have no information or you don't believe that to be the case? OLEG DERIPASKA: I don't believe. I have no information and I don’t believe that to be the case. OLEG DERIPASKA: And I told this September 16 when I'd be taken by surprise, when this three FBI gentleman intruded into my house claiming that they were my friends to the lady who manages the house. GEOFF CUTMORE: So, you told the FBI this? OLEG DERIPASKA: Straight. September 16, I think it was 2014 September 16. GEOFF CUTMORE: So why does the FBI represent that it continues to want to talk to you if you’ve already had that conversation? OLEG DERIPASKA: I’ve never seen. How is it represented? GEOFF CUTMORE: My understanding is that the FBI says it's been trying to talk to you for the last 10 years. You feel that you've answered enough questions as far as the FBI is concerned. OLEG DERIPASKA: We had one case when they approached me to help. I don't want to mention it and I don't want them to share the feelings of the people who suffer. And the guy who's been on top who was this retired gentleman McCabe who in my view was very professional and the way he tried to save the other lives was very, for me it was important. And the way we discuss the issues, I said please, it was already more than 10 years and it was smoking this from the State Department. Saying I’m wrong guy, bad history. I don't want to just repeat this allegation myself. It's absurd. And he assured me that I said please give me file, give my lawyers file, we will try to look you know we'll try to connect the missing point. Just I want to clear my name. He said there is nothing there. If you talk about this conversation it was done in 2005, 2006 I don’t remember. GEOFF CUTMORE: Clearly you want to use this case against the Treasury to put this issue of sanctions to bed and move on with your life as you said, it's a different life you've been leading since the fresh sanctions were put in place. But do you see any opportunity here for the West and Russia to move on while this issue of sanctions remain very much at the heart of the relationship? OLEG DERIPASKA: It's you know the way I see it from your side it's impossible. But if you look at the reality Russian people, American people they don’t hate each other. Actually the U.S. was a model for people like me after Perestroika and decided to change the system and was peaceful transition again because people been, people believe that we can establish a system based on democracy, fair in the capital system, in the private economy, social system everyone seen around looking at Sweden. And of course in the heart of the Russian people I think there is a room not to go in and start new, new page. But the problem is, all of this muscle flexing from both sides, and we have three point four trillion dollar we spent today on military new equipment and defense and half of it maybe more than two trillion dollars are necessary. And if you put this money you know on environment or in any type of infrastructural development, to change situation in the Middle East, in Africa and Latin America even in Mother Russia. I mean Russia under tremendous pressure. 10 years, no growth. And of course when you ask sanctions, they’re not just affect on me but on the Russian economy and of because it's a waste of time. I can’t see any strategic dispute between US and Russia. For me you know we wipe 10 years of struggle for something which I couldn't figure out and it's cost Russia a lot of money. And of course it's not, we'll end up in anytime sooner. And of course it's hard to see how, how to resolve it. There should be very strong in the leadership and action from both sides. GEOFF CUTMORE: Well let's face it 2014 and Ukraine and Crimea have been flashpoints in the relationship ever since. We're just weeks away from another Ukrainian presidential election. Do you think there is any opportunity here for the governments of Ukraine and Russia to come closer? OLEG DERIPASKA: No, no, I blame all sides. But, now it's important what will be way out. I've been quite substantial, I invested a lot of money in Ukraine and those factories still are working well and business profitable. And I see you know how countries suffer, and Russia suffer as well as I mentioned. But again the economy grows and economic cooperation and I could speak only on this subject. It can heal and could help people to find a compromise. GEOFF CUTMORE: We're coming up on another U.S. presidential cycle. There were great hopes here in Moscow. I think before President Trump was elected that there might be a fresh start in that relationship that hasn't happened. We have the Mueller investigation ongoing which still appears to be searching for evidence of collusion over determining the outcome of the 2016 election. You think there's any prospect of an improvement from a fresh president in the United States and an end to the Mueller investigation? OLEG DERIPASKA: You really see that there is a chance for a fresh president? GEOFF CUTMORE: I'm just floating the possibility -- I'm not the one -- I'm asking the questions of you. OLEG DERIPASKA: I understand but I’m just trying to understand, are you serious? I think the way U.S. politics develop now everything will be the same in four years. GEOFF CUTMORE: Why so pessimistic? OLEG DERIPASKA: You need to change generation. It's look like we've come to the point when only new generation will do something. This would prefer to have fighting. I see comments from Congress, from people in the media, a lot of lobbyists which benefit out of conflict military complex. All of this that was a straight fighting. It's a profitable business. Why it will be stopped? What was this new idea this new (incomprehensible) which will stop people and tried to as you said, I just can’t see it and it's very sad. GEOFF CUTMORE: Let me come back to that. Do you think Mueller will run its course without anything being found? OLEG DERIPASKA: Again I can see the same as you. Open source. But if there is no facts no evidence for last two years just can't see any surprise. I hope there will be no surprise. GEOFF CUTMORE: We see two other issues on the table at the moment and I'd be interested in your opinion on these. One is Nord Stream 2 now which has become a fresh irritant with the United States looking to sell its own oil and LNG into Europe and other markets. And then of course there's the issue of Washington pulling out of the intermediate nuclear missile agreement. These are two fresh fronts in many senses. Again are you as pessimistic as you seem to be about resolutions on these issues and the reasons why they have become flashpoints? OLEG DERIPASKA: To be honest I’m very busy today with my own problem. But I can give you a short comment. Nord stream – it’s competitive project. If gas wouldn't be competitive price delivered to the customer in Europe, then they will buy LNG and I understand that there is a still infrastructure problem but not so, not as suspended. That's why I just can't see. And a missile treaty. And it's all about China not about Russia. And everyone knows this. And I went to Munich conference tried to understand better. And again I was very surprised that this conference which was based in Munich very symbolic city as you remember. And the main reason to find peaceful solution this time was total, totally focus on how to advance you know this military bullying and consolidate around enemies, around Russia. Russia will never, in my view. As far as the Russians can see, we’ll never attack and invade a NATO country. I just can't imagine what would happen in this case would began. GEOFF CUTMORE: Why does Russia then believe that anybody would attack Russia? OLEG DERIPASKA: And it's obvious -- why do we need to extend NATO's states towards the Russian border? Why in all these documents you claim Russia [inaudible]. Even Mitt Romney when he ran this presidential campaign and he's a great guy and I can see his achievement and maybe he's the only one in the Senate who is capable to do something because you have a lot of lawyers, people who are very highly educated but have no idea how to do something. Even he, for some reason, you know claims a Russian magistrate. I'm here I'm in Russia and living in Russia and I can see people and I just can't imagine. And to be fair when this tragic accident happened in Syria when the US-led coalition attacked Russian, even [inaudible]…happy to slaughter so many Russians it was the first time in history you need to understand what the terror status first time in the history American openly attacked Russian. I just can't imagine even now that someone in the Russian military will use the same pleasure attack Americans. I just can't understand how and when was the breaking point when you know and after said to you ask why Russian leadership, governments are so focused on securing their military independence. It's obvious. As outside and not part of this conspiracy game. But I'm taking my view. GEOFF CUTMORE: Yeah. OK. And that's, that's your view. I don't have all the detail on the situation that you referenced. OLEG DERIPASKA: It's all open source it's open source. OLEG DERIPASKA: It's not me. I mean I'd like to talk about my case and opportunity to seek justice in the U.S. legal system. You tried to broaden it - OK. But as I said my strategy is always to be as transparent as possible. As I said I started from nowhere. I was sitting in library in university when I ran out of money and I went in and tried to make money tried to make something for my living. You know I become mental trading, broker on commodity exchange. I invest in a plant. As long as I've managed to build successful enterprise I went to IPO. I filed tons of documents to investors where I present everything tried to open judges -- there was a legal firm, investment bank who could see it. No one found anything which was always stated by my opponent. Or I don’t know, I'm not a politician. Why I’ve been targeted by US State Department, nothing’s been found. GEOFF CUTMORE: But you know why. Because people connect you with President Putin and they say that there is a close relationship and they also say that you became wealthy because you were prepared to deal with gangsters here in Russia at the time. You know I'm not saying any of these allegations are true. But you understand why people take the view that they take a view because of those allegations. OLEG DERIPASKA: Thank you for reminding me. And let’s go through the facts. I paid money, over a billion dollars, to buy out 50 percent stake in cash and asset from Abramovich before Putin becomes President. What's the connection – tell me? I know, no connection and it’s not fit with this narrative. I made my business transparent. I set risk assessment teams in all of my company just to make sure there is no one, criminal world who could touch my companies or companies where I was founder or major investor. And it’s a proven fact by board of directors by auditors, yearly audits all these years yearly audit for more than 27 years. And there is only one on my scale in Russia would produce it. I was paying taxes back in the mid-90s. Why? Because this tax was a foundation for municipal services which were able to reinforce the law enforcement people who were working in Siberia without money just because they had been courage enough to fight organised crime. But again, it’s not a subject. We have a simple issue. I've been unfairly treated in absurd action and my lawyers just asking the other side which will be represented by Justice Department presents facts which was led, and what action was taken 6 April. Very simple. And why doing this as you ask me, I just want to make sure that it will be hiding behind any national security interest or I don’t know, why these facts couldn’t be presented. And if facts didn't fit with action then I expect the justice. GEOFF CUTMORE: And I think it's important to ask the questions that people will be asking around this let me just finish up with a final question to you. You've been a businessman here for many years. You understand the nature of the economy. People are constantly frustrated that they see Russia underperforming economically and there is an issue with productivity. The president has announced a 390 billion ruble plan to invest in key sectors. Do you think that that will help Russia achieve a higher level of growth from here? Will it help your business interests? OLEG DERIPASKA: I'm sure you didn't get enough what's my position now. First of all, company which I founded. People who are trained, raised as a management run a very productive operation and we’re maybe not excellent in operation practice, safety, quality control, innovation. But if you see the result of the companies which present regular public open it's not for us in many cases better even Chinese who is now in the lead in many, in many areas. I'm not just excluded from U.S. financial system. You understand my position. I'm also excluded from Russian financial system in a sense that Russian governments and central banks literally follow the sanctions. They don't want to risk any big institutions here to be part of a secondary sanction, fears that secondary sanctions could hurt them. And then you understand my action - because I was totally isolated. And I myself don't want to have to say put other interests and damage on them by not moving. I don't need money and I'm working always on them because I have an interest. In doing something new in developing or help people to grow. But even my charity when they tried to support scientific research and there is scientists who work in foreign countries and who would be offered to have a grant. They couldn't open bank account to get this money. When my charity in a building something I could not go and get construction in the service company and equipment providers, house, internet is open. You can google and you can see everything, bridge connected me to it and it was my life. I'm not something who hiding behind someone. I was always in the conducting business open and transparent. With old debt, declarations, taxes, you understand. OLEG DERIPASKA: So when you talk about something which can benefit them as this moment, nothing could benefit them because I'm not in business. I've been kicked out for the next two years while I have this battle. GEOFF CUTMORE: So if this fails what do you do next? OLEG DERIPASKA: I already found. But it’s for my own. If you allow me to keep it.